This is the 3rd installment to this year's Halloween nail art designs. It has been a tradition here in Simply Rins that I dedicate the month of October to coming up with interesting Halloween nail art ideas. What I'd like to share with you now involves my favorite color -- red. I simply called this design, "Blood Spill" because it looks like it. Well, at least that is what I wanted it to look like. A lot of nail artists have done this design and I wanted to do it the non-traditional way and hoped that it would give the same effect. I'll let you be the judge of that. Did you notice how it is different from the usual blood nail art? Yes, instead of applying a white polish for base, I used a red instead. 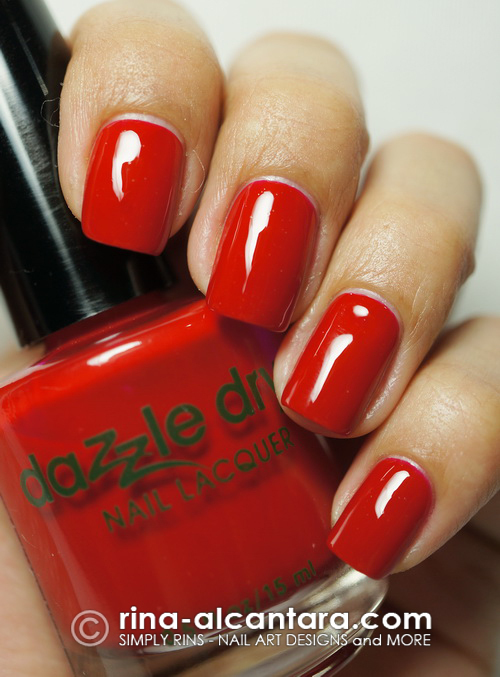 This is Dazzle Dry Rapid Red, a basic creme red lacquer with excellent consistency. Two coats is enough for full coverage. I don't really know if red is a good shade for my skin tone. But I am in love with this color for as long as I can remember. I sometimes have affairs with other colors, but I always go home to red. Do you have an attachment to a certain shade like me? I reversed the traditional method of painting the blood drip over a white background. I used white acrylic paint with a detailing nail art brush to hand paint drips on the nail tips. In a way, you can say that I actually painted white blood spill. But after trying it in one nail, I think the effect was similar to the usual technique. Working with acrylic paint has its advantages but a disadvantage is when your design requires you to use paint on your tips. Remember to always seal the nail tips with polish. Use the closest color as the acrylic paint you used. This is one of the reasons I make sure I have the basic colors in my stash. Acrylics chip faster on the tips compared to nail polish. I recommend this design if you are looking for a Halloween nail art idea that is simple and easy to create. The design itself only need little precision. This would be a good practice for nail art beginners too! As an alternative, you can try to paint the white drips from the cuticle area. This would create the effect that the blood is coming from the tips. I think that would look great as well. I actually wore this when I attended a concert and I could only wish it was glow in the dark kind of polish or paint. I think that would have been a blast. But the concert was, so I'm not complaining. Did I made any sense out of this Halloween nail art design? You can browse through my other Halloween nail art here. as usual, they are lovely and fantastic. 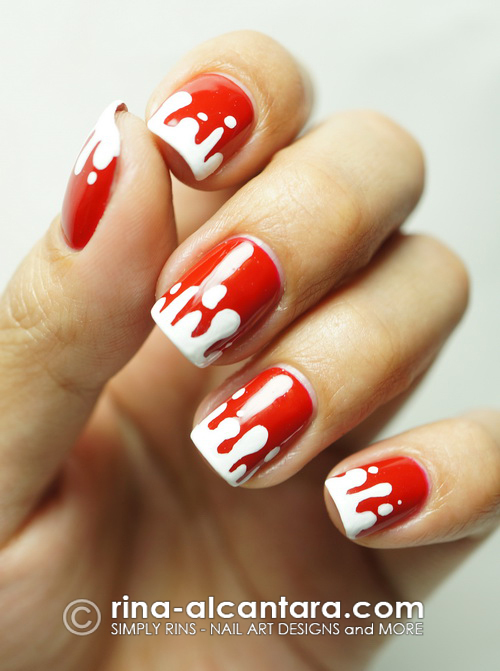 It looks very cool and I like the bloody nails more like this :-). Red is my favorite color too. This design is fantastic! Super clean, as always.